I’m Katie, the owner, designer, craftsperson, writer and all around crazy person behind the TreadlingHome blog and product lines. I have a passion for doing things myself; including everything from gardening (vegetables and flowers) to sewing, crafting and cooking. I also have a passion for teaching…that’s why I went to school for it! I have a Social Studies education degree from Edinboro University of Pennsylvania and love to tie what I’m doing with TreadlingHome projects back to the history lessons I’ve missed so much since leaving teaching. Each project we have done, whether it be a recipe or DIY project, has tied back to the way things used to be done and living a more sustainable lifestyle. The TreadlingHome blog has given me an outlet for my teaching affinities by allowing me to pass my knowledge and the lessons I’ve learned onto you. I love sharing my personal history attached to each project with you, my amazingly awesome readers. I am so excited to continue to share and spread my passions for the DIY lifestyle and helping others to become more self-sufficient. That, after all, is what the TreadlingHome lifestyle is all about; spreading your knowledge to help others pursue the life they want to live. My husband Josh and I bought our home back in 2015; a 2 acre plot of gentle rolling hills with a charming ranch style home located in southeastern Ohio. The first thing we wanted to do after purchasing our home was cover the windows to help start making our new house the home we had always dreamt of. I quickly realized that not a single window in our new home was a “standard size” since most of them are short and wide and seated higher than usual in the walls. After talking with Josh I decided to make my own curtains that would fit our style, and the windows, perfectly. I unpacked my heirloom treadle sewing machine (circa 1920’s) and got to work making valences for the kitchen and curtains for our bedroom. As I worked on these first projects for our new home, I began to realize that I was treadling my way to the home that my husband and I had always wanted. A place that we could express ourselves, do things our way and grow in love together; and for the past 4 years we have done just that. Our home is still a work in progress of course, since no home is ever really settled when you are a do it yourselfer. I’ve been trying my best to become the housewife and partner my husband deserves, and working hard to put my knowledge and research to work for us. Join me on my journey as I figuring out how to apply the knowledge and techniques I learned growing up with do it yourself parents and friends to make the life and home we have always dreamt of. 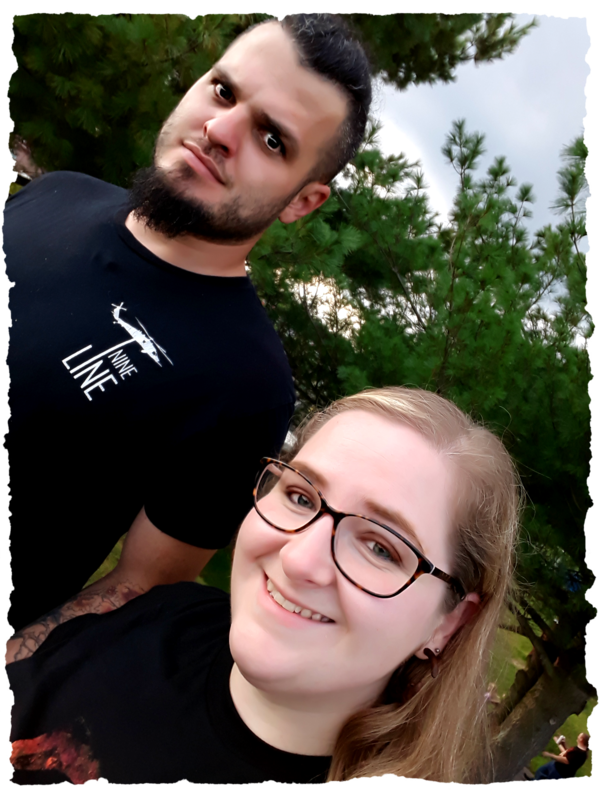 My husband Josh and I would like to thank you from the bottom of our hearts for being members of the Treadling Nation and are looking forward to continuing our journey with you by our side. Start your day off right with the perfect cup of coffee and my famous banana bread muffins. Learn how to care for your cast iron friends in the kitchen with our article Cast Iron Care for Beginners. Have fun and learn how to care for your home by visiting our Homemaking Skills section. Keep up with what’s going in the TreadlingHome-stead gardens and pick up a few tips and tricks for yours by visiting our Gardening section. Hi Raphael! Thank you so much for the compliments, I really appreciate it. I’m sorry you had an issue posting your comment, but I hope you will keep reading and commenting 🙂 Have a great day! Hello, after reading this amazing paragraph i am too happy to share my familiarity here with mates. Thank you very much Emilia! If you have any requests for post subjects, please feel free to ask. I’m always looking for new ideas that my readers are actually interested in. Thanks again! done an incredible job on the blog posts. in advance! I bookmarked іt. Hi Katie, my name is Cheryl and we met at Joanns yesterday. I would for you to be part of Quota Quarter Auction, Sunday , April 17th. Tables are 40. 00 with that you receive 8 coupons for paddl s to give or resale to fame lay and friends. Please sign up, our Teasurer Kristi, lives in Wellisville, would love to have her meet with you. How about becoming a member? Join the Treadling Nation to receive e-mail updates on new posts, recipes and events from TreadlingHome. Please e-mail with questions and specialty order requests.